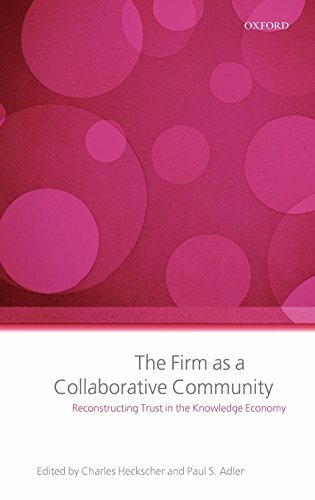 This volume explores the changing nature of community in modern corporations. Community within and between firms--the fabric of trust so essential to contemporary business--has long been based on loyalty. This loyalty has been largely destroyed by three decades of economic turbulence, downsizing and restructuring. Yet community is more important than ever in an increasingly complex, knowledge-intensive economy. The thesis of this volume is that a new form of community is slowly emerging--one that is more flexible and wider in scope than the community of loyalty, and that transcends the limitations of both traditional Gemeinschaft and modern Gesellschaft. We call this form 'collaborative community'. · An interdependent social identity that supports these organizational features: distinct from both dependent, traditionalistic identities and the independence of the autonomous self that is often associated with Western culture. This volume is a collaborative effort of leading scholars in organization studies to delineate the new form of community and the forces encouraging and constraining it's growth. The contributors combine sociology and psychology theory with detailed analysis of business cases at the firm and inter-firm level.